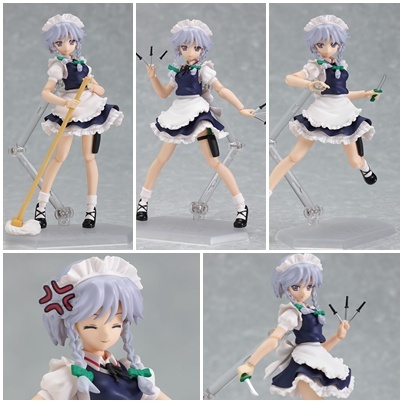 It's been a running theme lately for me to collect the Touhou Project Figma's that come out, and so I decided to pre-order Izayoi Sakuya as well. I was very happy with my service from Otacute last time, getting Figma Marisa Kirisame, and so I have pre-ordered Izayoi through them too. I have really liked the design and accessories that the Touhou Figma's come with and Izayio is no exception, she looks great and she has some very awesome accessories. However I have to admit that the clincher was her lovely heeled shoes, lol I am such a girl. Izayoi Sakuya will be coming out in late August. And very exciting I have decided to get my first still PVC figure. I have been interested in Mercedes from Odin Sphere for a while since she is just such a cute character and ALTER's version of her is just beautiful. I mean what else can you say she is just a beautiful statue. I read all the reviews I could find of her prior to ordering her for the re-release, and all the reviews were very positive. Like I said she will be my first PVC figure, I don't generally buy them because they are expensive and am not really into have a lot of statues hanging about to collect dust, I usually favor articulated figures as you can play with them (Yes I am just a big kid after all). However I was keen on this figure because she is to me a real piece of art and she captures my fantasy-loving imagination, also her base was a big drawing card as most figures have very boring bases but this one just added to her appeal, and so I pre-ordered one for her re-release from AmiAmi in late September. 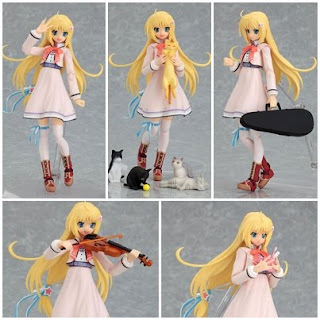 Next is Aya Kagura from an Eroge called Se Kirara, now I am not into Eroge but this Figma captured my eye because she is just so cute, her long blonde hair, blue ribbons and nice little boots. I had always had in mind that I would get her and then to my delight when more information emerged I found out that she came with a violin and a bunch of cats! I then got really excited, what fantastic accessories, especially the cats. So when she came up for pre-order I got one with AmiAmi and she will be out late September. 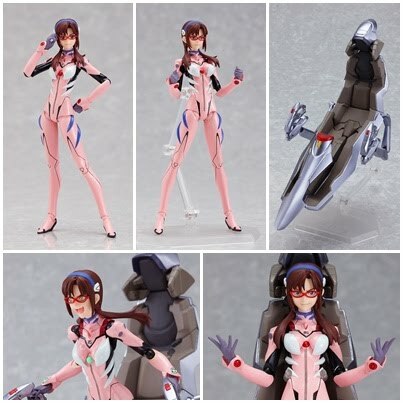 It seems like lately Figma have been churning out the figures, here is Mari Makinami from Neon Genesis Evangelion. Originally I wasn't sure if I would get her or not, I have not seen the new version of Eva and so I don't really know her character, but after viewing her pictures and reading up about her I decided what-the-heck I will pre-order her because when I get Figma Asuke she will want a friend (I know shock and horror I may not be getting Rei, as I find she is kinda so so as a character, please don't kill me Rei fans!). Once again pre-ordered from AmiAmi, and she will be out late October. A recent surprise was Figma Luka Megurine! This came as a big surprise to most collectors as she had been kept rather secret until just before her pre-orders opened. I decided to get her as I just love her shiny gold boots, plus I love pink hair, and in actual fact although I own a Miku Figma I actually prefer the sound of Luka's voice. 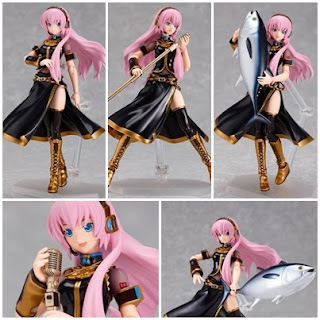 One thing I love is the fact they included a huge Tuna Fish, so random but awesome, I hope this means that they will make some other Vocaloid figures. Pre-ordered her from AmiAmi and she will be out in October. 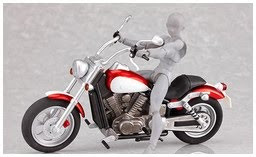 Also I gave in and ordered a FREEing Figma Ex:Ride American Bike in red, I recently got one of the classic bicycles in red and they are really awesome accessories and so I thought I would try the motorcycle too. Ordered from Hobby Link Japan. I found this figure via Tsuki-board the other day, its an upcoming articulated figure from the Play Arts figure line by Square-Enix. 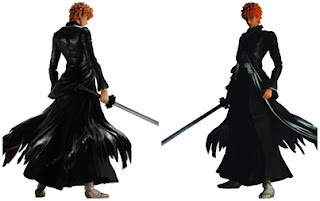 Ichigo Kurosaki from Bleach, it looks pretty cool and knowing the Play Arts line is bound to be a top quality figure. Although I don't own any Play Arts figures they are a figure line which I have been interested for a while but I have not purchased any due to the fact that they are expensive. However I could be persuaded to get an Ichigo figure, especially if there was a Renji or Grimmjow figure to join him. Then there is Figma Dead Master, now when the first images of her came out I wasn't very interested, like Black Rock Shooter I found her to be rather a dull character design, as I have not seen the anime or anything there is no personality draw card so I just have her character design to go on. However in recent pictures she showed more depth and I have been changed my mind about her. The paint work on her Scythe and eyes convinced me, because otherwise she is rather void of interesting features and paint, being dressed mostly in black. 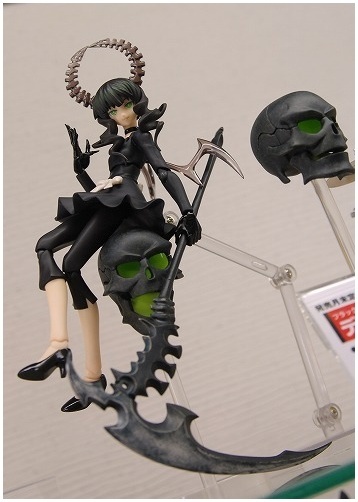 Any how I am convinced to get her when she comes out, however I still have yet to be convinced by Black Rock Shooter. Another still PVC figure that has caught my eye is Momohime from Oboro Muramasa from ALTER, like Mercedes she is really beautiful and has a wonderful base, but as I not very keen to get into buying a number of still PVC figures I think I will wait and read reviews of her before deciding whether or not to get her for myself, but she does appear to be a very lovely figure. That's all for now, I realize that I kind of wrote rather a lot about each figure. Oh well I hope you enjoyed listening to my ramblings.